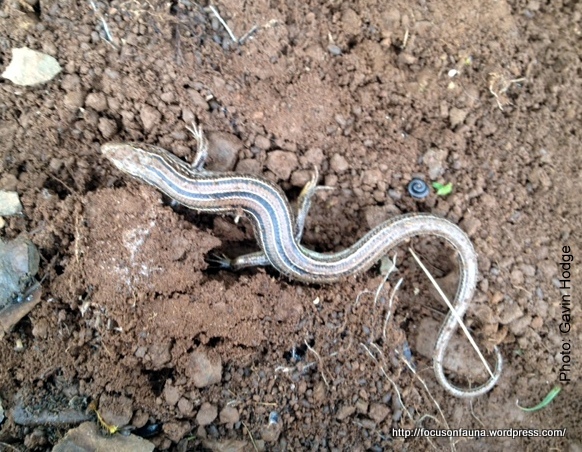 This handsome striped lizard turned up the other day on the steep slopes of Lade Hill just out of Strath Creek. Bertram, our Focus on Fauna reptile consultant, has identified it as a Ctenotus skink, most likely Ctenotus robustus or Large (or Eastern) Striped Skink, which is the most common skink of this genus. However the photo is not clear enough to make a positive identification. Ctenotus is the largest and most diverse lizard genus in Australia, with almost 100 species. Identification to species level is often considered difficult. The Large Striped Skink is found in a wide variety of habitats throughout eastern and northern Australia. It mainly eats ants, as well as other animal and plant material. It is a relatively large striped skink, with a snout to vent length (SVL) of up to 120mm. SVL, which equates to head and body length, is used to measure lizards, many of which can lose and regrow their tails.